Last week we got back to lessons. I didn't anticipate how busy we would be, nor that the girls were going to have their own ideas about how things should go, so it was a bit hodge-podge. Despite what I had planned, Moonshine desperately wanted to add Saint Catherine of Siena to her saints book. In fact, her only other request was, "Please, can we do more saints!" I wasn't planning on doing any this year! We had saved the last few pages in her book for memorabilia from our trips (pictures, postcards, bookmarks, pamphlets), but instead, she wanted to do some more "boy saints." Apparently I didn't give the boys fair coverage in our block this past spring. It's a good thing I still had a few more up my sleeve! I finally found chalkboard paint this summer, repainted my boards which were in terrible shape, and got them hung back up. 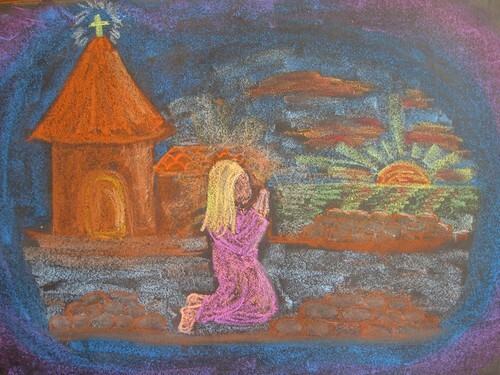 It had been so long since I had drawn on the chalkboard, so I was happy to put up my rendition of Saint Catherine gazing at the sunset. Moonshine took one look at it and declared, "Oh, that's just how I imagined it!" ... Whew! I drew Sunburst a geometric form to wonder about (yes, the heart in the middle is covering up my imperfections... but it's also serving as a reminder to put our hearts into everything we do-- an important reminder, especially given some new behaviors Moonshine is trying out). With chalkboard drawings up and stories to tell, we were off and running. We also reviewed some math and worked in two German lessons-- I'm trying out a new approach this year, and it seemed to be a big hit. Yay! We also worked in some reading practice, copywork/memorization, and quite a bit of handwork. All that and full afternoons, too! All in all, it was a good first week. It's always a bit hodge-podge, isn't it? Sometimes we achieve absolute flow, but I'll settle for enjoyable hodge-podge any day. And opinions are very good things, I couldn't agree more. I would love for my boys to give me feedback like that...so cool! They don't say much except to complain sometimes. 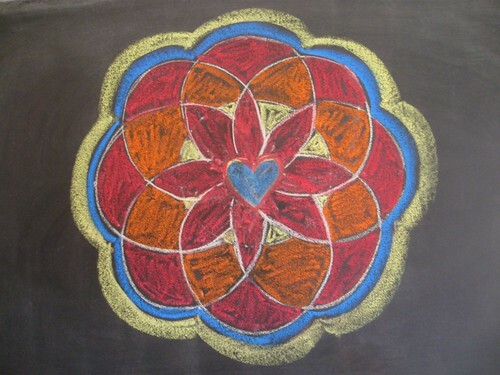 Beautiful chalkboard drawings! How do you cover German please? Liz, I will post an example soon. I love all your chalkboard drawings. What kind of chalk do you use? Mine seems to just fall off. I think it might be to slick. Do you have any suggestions for chalk, chalkboard and drawings?? I love your blog, and am so happy to have found you again. Hi Tanya. Thanks so much for the kind words! I use Mercurius chalkboard chalk and plain cream or white chalk to do my drawings. I love the Mercurius chalk because it is so vibrant. I got mine from their site, but perhaps others sell it (or quality chalks like it) at Waldorf supply stores online. I have had the exact same slickness situation when using store bought chalkboards (mine are from Hobby Lobby). What I essentially had to do was repaint them with chalkboard paint-- you can find this as a spray or in a can at a home supply store. I've tried both, and I prefer the roll on paint with a very fine roller. The rollers should say which gives the least texture, and that's the one you want to go with. I did two layers of paint and let it dry for a couple days, then I applied cream chalk to it, heavily in all directions before erasing with a dry cloth. That gives it a nice base for drawing.